Sometimes no wave has too much no and not enough wave. For example, I prefer the more accessible work of James Chance to the noisy mess of DNA. It's probably better to assume that most no wave acts did it all, not restricting themselves to one style or genre or "wave," but rather producing accessible pleasant work as well as noisy challenging feedback puke - that breadth of output is what makes them no wave - but I still tend to put no wave groups into one of those two boxes. 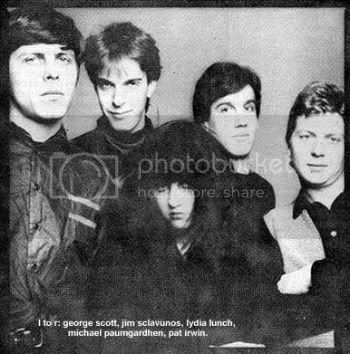 I always thought Lydia Lunch belonged more to the DNA camp, full of noisy scary things, but "Lazy in Love"from her group 8-Eyed Spy had me thinking otherwise - until I listened to the rest of the album and some live stuff. Don't let the polished, tight, melodic bliss of this song fool you, the rest of the stuff is pure no wave abrasion. Obviously she's a woman of many talents. Awesome no wave photo archive!!! I've always loved Teenage Jesus and the Jerk's "Orphans". Determinately repellant stuff. My friend and I played this over and over, while his kid brother screamed "This ISN'T MUSIC!" congratulations for your blog but diddy wah diddy is a cover of a Bo Diddley song.captain beefheart did cover it too..